More than 30,000 people a year are killed by gun violence, including 50 killed near the Los Vegas strip last month where this makeshift memorial stands. "The response was swift," says former Surgeon General Vivek Murthy, and was even faster during the Ebola outbreak a year earlier. But last month when 50 people died and more than 400 were injured in Las Vegas, and weeks later another 26 died in Texas of the same cause, public health officials have had almost no role. That&apos;s because the victims in Las Vegas and Texas were killed with guns. And over the last three decades, Congress has made it clear that they don&apos;t want the public health community looking too hard into the causes of the violence. "If you look at the number of people who have died or been injured from gun violence, that dwarfs the number of people who have been affected by Zika or Ebola. There&apos;s absolutely no comparison," Murthy says. More than 30,000 people are killed with guns in the U.S. every year. That&apos;s more than die of AIDS, and about the same number as die in car crashes or from liver disease. 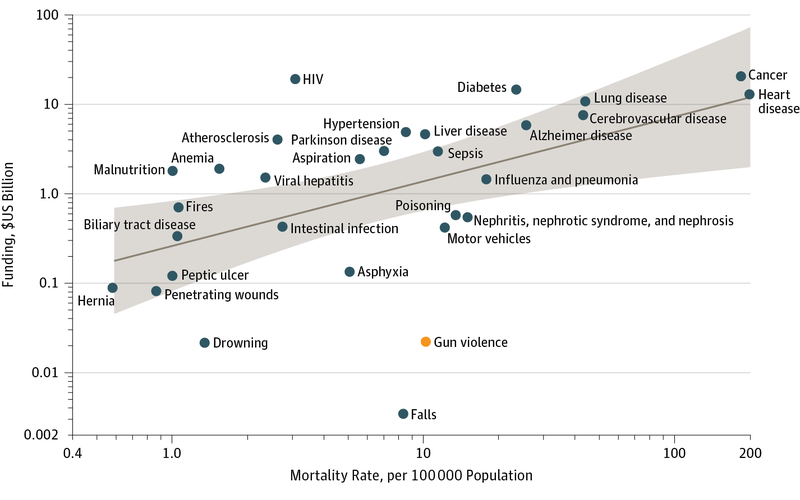 But unlike AIDS or car crashes, the government doesn&apos;t treat gun injuries or deaths as a public health threat. Murthy and other public health experts say it should. "It should be no different than the approach we take to cancer, heart disease or diabetes," he says. But such an approach would have to start essentially from scratch. The government spends only about $22 million a year on research into gun violence — a tiny fraction of what it spends on other major health threats. That&apos;s because of Congress. Back in 1997, lawmakers added a provision in the bill that funds the Centers for Disease Control and Prevention barring the agency from doing anything that would "advocate or promote gun control." At the same time, they cut CDC&apos;s budget by the exact amount it had been spending in gun violence research up until then. So government research into the causes of gun deaths virtually stopped. The issue comes up routinely after mass shootings. Two years ago, after a young man killed nine people in a church in South Carolina, a reporter asked former Republican House Speaker John Boehner about the CDC restrictions. "The CDC is there to look at diseases that need to be dealt with to protect the public health. I&apos;m sorry but a gun is not a disease," he said at the time. After the most recent shootings, Democrats in Congress have called for more restrictions on guns while Republicans, including President Trump, say the problem is mental health. But neither conclusion is backed by research, says Dr. Georges Benjamin, the executive director of the American Public Health Association. "When a new disease, particularly an infectious disease, enters the community ... we have a mechanism to anticipate it, track it, get our arms around it," he says. "We do that when he have measles, mumps, chicken pox, zika. But firearm-related death and disability, we don&apos;t."
That kind of prior knowledge could lead to policies that reduce the toll of gun injuries without cutting off access to them. "Firearms are a tool, and ... a consumer product. And unlike other consumer products, we&apos;re not working hard to make that consumer product safer," he says. Take cars for example. Benjamin points to the combination of safety features — airbags and seat belts — and safety policies like requiring licensing and banning drunk driving — that have made cars less lethal, while ensuring they&apos;re still available. A similar strategy with guns could lead to some laws or regulations that make them safer. That could involve barring large ammunition clips to limit the number of shots a person could take, or requiring trigger locks that open by fingerprint, allowing only the gun owner to fire a weapon. "We could think about where firearms ought not to be," he says. "Alcohol and firearms and people who might get a little rowdy probably are not a good combination. There are solutions to that." Creating more shooting ranges may be a good idea so gun owners have a safe place to use their weapons, he says. Today, Benjamin says, there is no data to show whether people are safer in communities with more or fewer guns. Something has to change, because up until now, "We have done everything we can to ensure that this epidemic of death and disability from firearms is only going to get worse," he says.